Cougar Fever is the name of the student-focused week in the fall semester. Articles from 1994-2014 covering Homecoming games and activities. The Masquerade Ball has been held at the same period some years. Cougar Fever is the spirit week earlier in the semester. Announcements and reviews of the Masquerade Ball, commonly held during Homecoming Week. The first ball was held during fall 2001. The success of the Ball inspired the Spring Fling for students held several years. The Pioneer was published from September 1990 until March 1993. 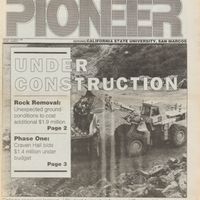 The Pioneer was the first student newspaper published on the Cal State San Marcos campus. Plan 9 from Outer Space was published from March 1993 until November 1993. 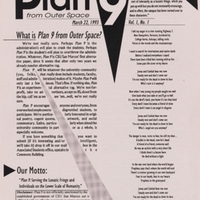 Plan 9 from Outer Space, or Plan 9 for short, was an alternative and independent, satire newspaper. 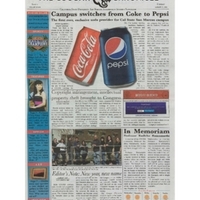 It was not associated with CSUSM's campus newspaper the Pioneer, which printed similtaneously. The issues included original artwork and poetry, quotes, and social commentary submitted by students and staff alike. Plan 9's motto was: "Serving the lunatic fringe and individuals on the lower scale of humanity." The Cougar Chronicle began publication in January 2012. The name of the campus newspaper was changed from The Pride in an effort to convey diverse aspects of the student body and pay homage to the campus mascot. The edition publishes bi-weekly. 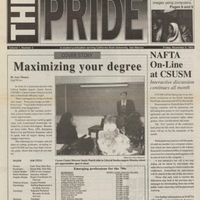 The Pride was published from November 1993 until December 2011. The new campus newspaper title was determined as a result of a student contest. The title was selected because "it conveys the notion of pride in oneself, one's school, and one's community." It also represents the school mascot, the mountain lion. During these eighteen years, the Cal State San Marcos campus grew into a remarkable institution of higher education. You Name It was published in October 1993. 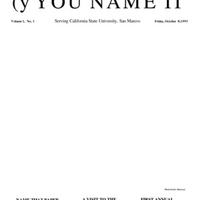 The title "You Name It" served as a place holder until newspaper staff could determine a permanent name following the previous newspaper title, The Pioneer. In order to select a new name, the staff held a contest for the best newspaper title. You Name It ran for only two newspaper issues.